I just did not have any culture and wanted to try it. I seen many individuals online that were making it w/o a starter culture. Cultures dont last very long ? and are expensive. How long can you store commercial cultures for? grisell wrote: Glad you made it! Don't take me wrong. I didn't say it was poisonous. I just said that I myself wouldn't eat anything with wild grey mould on. But that's my opinion. You seem to have made everything else right. If you try a mould culture next time, it will be even better! Thank you.. looks good. originally I wanted to dry it a little more. I need to get better prepared for making this, thought I could get away with it. First attempt at this type of fermented meat. 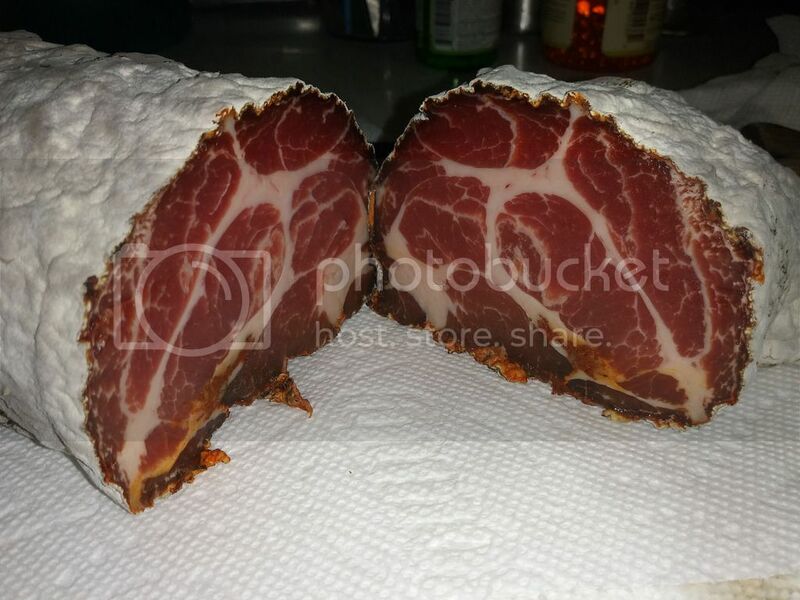 What is your opinion on that coppa, that after washing turned all white. I still see some hit of blueish color underneath. The lonzino has a woody or nutty smell, is that typical? Pork loin is a mild tasting cured meat but is improved by longer aging. You might consider a casing of some type to allow for this. Breeding your own mould is stimulating, interesting and will improve your products. I made a post about this a couple of years ago. Please read it. And good luck! A lot of people still ferment wine with wild yeast. Anything I make always needs improving, never ending venture. grisell wrote: Breeding your own mould is stimulating, interesting and will improve your products. 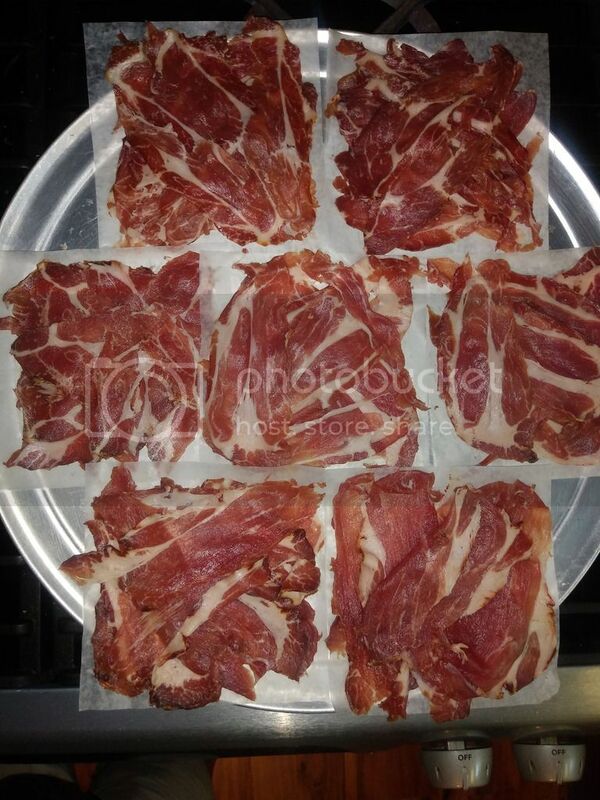 coppa - well the mold went from white (after wash) pictures above to gray green in one day yesterday. It is fully covered this time after washing it. Good bad? The smell you describe is from the mold I believe. Another way to hold the mold off a product is to cold smoke it at the beginning of the drying process (assuming the flavor profile works with what you are trying to make). I'm not sure I'd go as far to say that it's stimulating and interesting, but it's a good way to get good moulds established in places where mold 600 isn't available to the home-curer (like the UK). well I gave some of the Lonzino to a friend, he loves it. So should I keep washing it off now and then or just leave it on the coppa? NCPaul wrote: The smell you describe is from the mold I believe. Another way to hold the mold off a product is to cold smoke it at the beginning of the drying process (assuming the flavor profile works with what you are trying to make). well just cut it.. flavor is good, almost buttery melt in your mouth and lightly spicy. Underside damp from laying down on screen close to water (came from meat). Just ate some will let you know if I am alive tomorrow. leave mold on or wash it off.. now or when you eat? How to store this, can it be froze.. if yes cut before or after freezing? I would clean, slice paper thin, vacuum package in small portions and freeze most of it. It looks like it won't last long. Good job. NCPaul wrote: I would clean, slice paper thin, vacuum package in small portions and freeze most of it. It looks like it won't last long. Good job. thanks.. seems to have turned out very good, melts in your mouth. Would you wash mold off? Its kind of dry and crusty feeling. I have not really tried to remove it, seems to be sticking on the meat well. the bottom (orange) has mold too, the orange is paprika and spices.. it was a little to close to the water on the screen it was laying on making it damp on that side a bit. More air circulation would been better. I put it in the fridge overnight last night damp side up to try and dry it out more. Going to try and scrub it clean today and slice it. thanks for input.. Need to change a few things if I do it again. I have a converted fridge to do this in, now its being used as a fridge. Might try and find a used large wine cooler. well this is all I get out of 3kg.. will not last long.